The injury President Obama suffered Friday in a basketball game at the White House is well known to many of us. Dr. Tony Youn, a board certified plastic surgeon in Detroit, Michigan, said it’s the most common injury call he gets from the emergency room - someone gets smacked in the face and ends up with a cut lip. It usually happens when a tooth punctures the lip. The lips are made of mucosa, the moist tissue that makes them fragile (especially to a flying elbow). White House aides told CNN that Obama was given a local anesthetic while receiving the stitches and doctors used a smaller suture thread, or filament. That increases the number of stitches needed to patch up the tear, but it makes a tighter stitch so that the president's scar on his lower lip should be smaller. Dr. Laurie Casas, a clinical associate professor of surgery at the University of Chicago Pritzer School of Medicine, said that 12 stitches aren’t a lot, since each stitch can be as small as two to three millimeters. A deeper injury penetrating the muscle layer in the lip would require a more complicated stitch called a buried stitch, she added. Depending on whether the stitches are on the outer layer of the lip or deeper into the muscle, the stitches could be left in from five to 14 days. Stitches in the muscle layer of the lip would typically dissolve. If they’re not lined perfectly, you could see a “cosmetic deformity,” said Dr. Marc Yune, a certified facial plastic surgeon in the greater Atlanta area. Obama can expect swelling and bruising for a couple weeks. And he, like many others with a severe lip lacerations may be told to stay on a liquid diet or avoid crunchy foods, to prevent a potato chip from slicing through the wound. I wish I was playing ball with Barry, he would have gotten more than just a split lip. I can guarantee you that ! It is so funny that all anyone can do is complain. Obama is this or that or he did this or that or is not living up to what he has promised. Who in this world does? If your all so unhappy and can do a better job than lets see you get elected and run the country! Untill then shut the f@#k up! mrsputtytat, I would think that anyone on this page with the exception of you would be more qualified that he, And since you like the F work, Do you have the slightest FN idea how he was elected, funded by, with the intention of? mk? I would venture to guess that you would never have overlooked his shocking past if a man with this backround wanted to date you? You wouldnt let a man like that in your house would you, or even to look at your children? And yet you made the decision to make him the leader of our once independant nation? Dumb beeatch, keep your comments to yourself. I'm impressed with the number of MATURE comments. All yall other hillbillies need to reminise about the other guy from TEXAS that used to pass out and soil the carpeting in the oval office. Or how about the guy who's cheeks sagged inch's below his chin while he chided us about kicking him around no more.was I the only one that noticed he slid his feet across the tarmac without lifting them.Pretty tricky stunt.I think Pres. Obama is along three other HONEST OR CARING leaders of the last half century.JFK had his issues but I believe he really cared about US.Pres. Ford was a good man with a MEAN golf club. Pres Carter was bprn a saint and simply should be knighted or whatever BEFORE he leaves us.Pres Obama is a MOSIAC of past decent men and with support from the rank and file he may surprise yall.The Limbaugh/Hannity fear mongers need a serious a** kicking. I'm not screaming viva Obama but he is more of a man fhan 90% of the republicans I know.enough,don't divide what's left of this Ragged counyry! I'm impressed with the number of MATURE comments. All yall other hillbillies need to reminise about the other guy from TEXAS that used to pass out and soil the carpeting in the oval office. Or how about the guy who's cheeks sagged inch's below his chin while he chided us about kicking him around no more.was I the only one that noticed he slid his feet across the tarmac without lifting them.Pretty tricky stunt.I think Pres. Obama is along three other HONEST OR CARING leaders of the last half century.JFK had his issues but I believe he really cared about US.Pres. Ford was a good man with a MEAN golf club. Pres Carter was born a saint and simply should be knighted or whatever BEFORE he leaves us.Pres Obama is a MOSIAC of past decent men and with support from the rank and file he may surprise yall.The Limbaugh/Hannity fear mongers need a serious a** kicking. I'm not screaming viva Obama but he is more of a man fhan 90% of the republicans I know.enough,don't divide what's left of this Ragged counyry! It is very true President Obama is very CARING and HONEST person. I'm reporting your message as abuse. For all those who post the negative stuff and complaining about what the president is doing wrong and wishing he fails at fixing the problem he inherit, I think all of you are part of the group along those others in washington who seems to possess a one word vocabulary! Those guys who mess the country up, and now that this cool. Calm and intelligent man is doing his best to get america moving in a direction that will make the country and the world a much nicer place! All the help he is getting is hate filled complains and NO! you guys are to be blamed along with the previous administration for the mess this country is in at the moment! Instead of all that useless running of the mouth, take some time and honest look and am sure you will see that he has indeed done much for the USA in the short time he has been on the job, he will go down as one of the best POTUs regardless of all the haters who even want to harm him physically! happy holidays. feliz navidad. To God be the glory!!!! The Lord is my shepperd i shall not want. He maketh me to lie down in green pastures. he leadeth by still waters. He restores my soul. He leads me in the path of righteousness for his name sake. Ye tho i walk through the shadow of death, i will fear no evil, for thou art with me; thy rod and the staff, they comfort me. Thou prepares a table before me in the presence of mine enemies; thou anointest my head with oil; my cup runneth over. Surely goodness and mercy shall follow me all the days of my life and I will dwell in the house of the lord forever. amen. The prayer is for every one and anyone esp. Obama nd his fam. peace. hopefully the doctor didn't permanently sew his lips together and make him mute. that means we would have to listen to the drivel of joe biden. Why did Sarah Palin took course of journalism her voice sounds TERRIBLE every time she is on TV I have to change channel it is very annoying and non sense topic. I think Limbaugh wish that he could be as Fit as our President Obama , very intelligent tall dark and handsome very caring person. To the person who mentioned about President Obama's past , WHY it is shocking? just because his Father was black and His Mother was white and left the family when he was very young . it is not his fault ... if you think he was not born here in the U.S. because his father was black and don't believed Hawaii is also one of the State of America, Are you that misinformed ? or being brainwashed ? Ok this is my point of view we r supposed to pray for our president/leaders no mater how much we don't like them but as for likeing what they do; we don't have to! However... I do believe this is the medias fault not obama they are the ones making a big deal out of this not him. But I do believe that if they did not do this then there would be so many more roumers going around than what people have already said like "his wife busted his lip and its a cover up" lol some ppl have nothing else to do other than make stuff up lol! Anyways there's no reason to be arguing about this he busted his lip, they write a few articles about it! Who cares life goes on! Its called freedom of speech! I think cnn has the rigbt to report on anything they want to. if the president had a heart attack that wouldnt be news either? huh i didnt think so. point is yes president obama has a boo boo on his lip and yes its news worthy because he is the president of these united states or did everybody just forgot that! Well people say 0bama is biracial.Die he born in USA haway wasnt state in the year he born? and President OBAMA was born AUGUST 4, 1961 ... I give this information to certain group of people maybe were not really studying in School or not learning anything at all......or don't care about learning U.S history.! Stop Being rasict all you haters.i know your mad cause t5here ain't another white prez. Tea party are funded by Corporation Greed . When some one throw those SHOES to former president Bush I WAS very UPSET. Even though his performance as President was Horrible ! 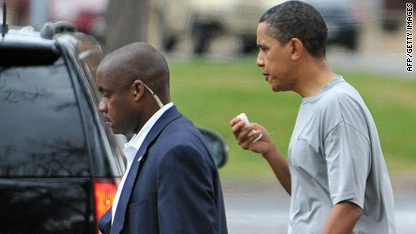 He still needs Respect... and President Obama's Lip Injury is not to making FUN off.